The championship game of the NCAA Men’s Basketball tournament was a great game, with Duke beating Wisconsin, the sportsbooks favorite to win. The upset was surprising, as Wisconsin was actually in the lead during most of the first half, where they ultimately let their guard down, and Duke made a nice comeback. The college player’s that turned it all around for the Blue Devils were Grayson Allen and Tyus Jones, with the rest of the team being an amazing support. Both of these players come highly regarded by head coach Mike Krzyzewski, who says freshman superstar Jones will have a very promising career. 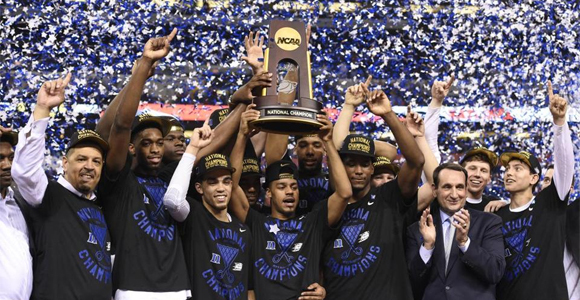 Krzyzewski took Duke to their 5th NCAA championship title, and despite what any of the sportsbooks said, they certainly did not play like the underdogs. Despite falling behind in the first half, they regrouped and showed everyone that Duke has enough talent to beat anyone, regardless of the odds. The game ended 68-63 in Duke’s favor, and for those that want to check up on the key players and plays can check them out here.